As we mentioned before there are many good books and even CDs on oven building, almost as many as there are different opinions regarding the type of oven to build. Here I will attempt to simplify some of the many different ways to build a base for a kit oven through to building a full brick oven. 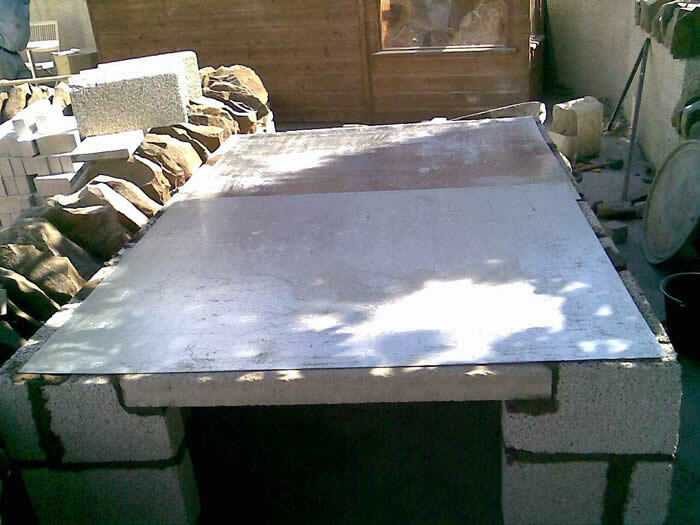 Most of the literature is based on building an oven in the USA, where the rules and regulations concerning structural foundations for buildings are very strict due to the extreme temperature differences and phenomena like “frost heave”. 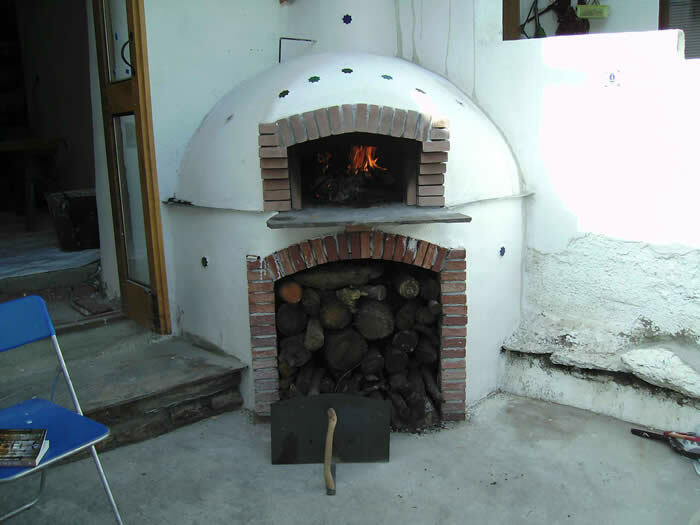 In the temperate UK we largely do not suffer these weather variations, so a base built for a domestic wood-fired oven does not have to be on quite the same grand 225 mm hollow blocks filled with concrete. We use a building system that is simpler, more efficient, and cheaper; it uses materials that are easy to locate from local sources, and it is easier on your back! First, we shall deal with the base or stand that is to be built for an oven. The most common design - and in many ways the most sensible - is a simple structure of three solid walls and one wall with an opening in it. The space below the oven can then be used as a handy wood store. 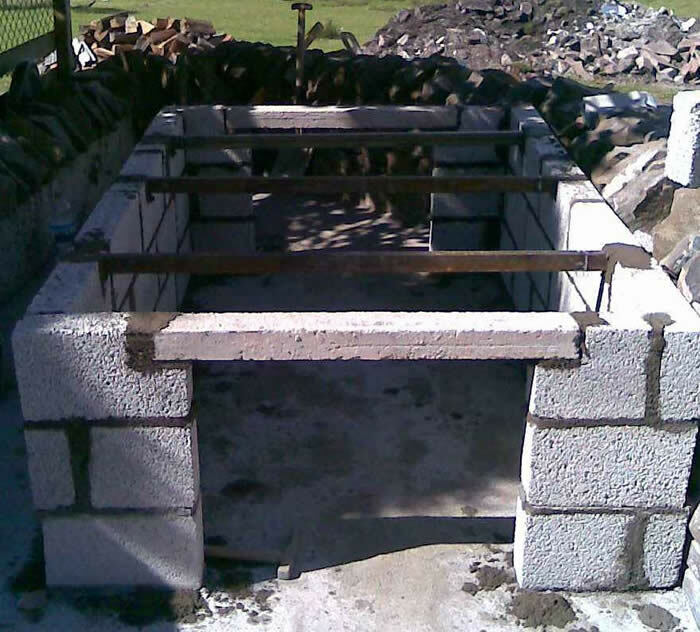 Generally, this base is composed of the rear, left and right hand walls being built from solid 100 mm blocks or bricks and the front wall featuring a doorway directly under the oven’s door. 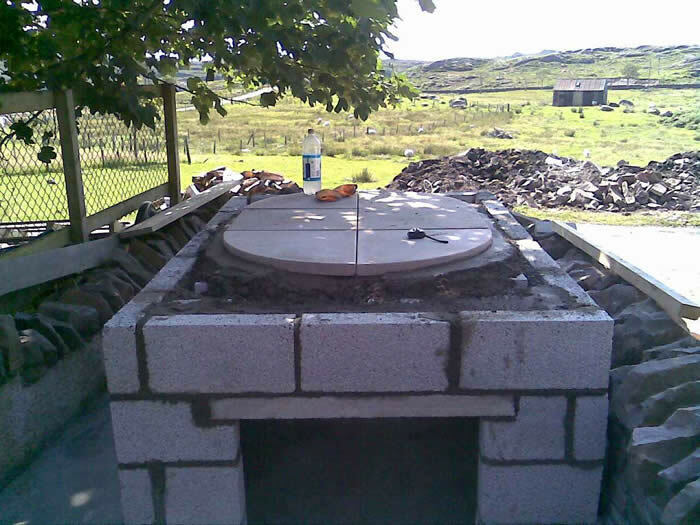 Once the size of oven has been decided, dig out a suitably sized area so that a concrete plinth of around 100m thick can be laid, this plinth will form both the foundation for the oven and also the floor for the wood storage area under the oven. 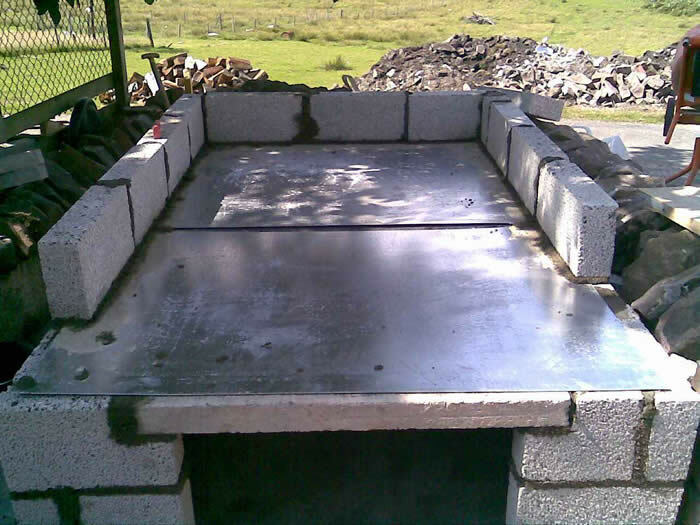 For this example we will assume the oven stand or base will be built using 100 mm concrete blocks. However, the structure can also be built from brick or stone. Just convert the dimensions for this block stand into bricks or stone accordingly. 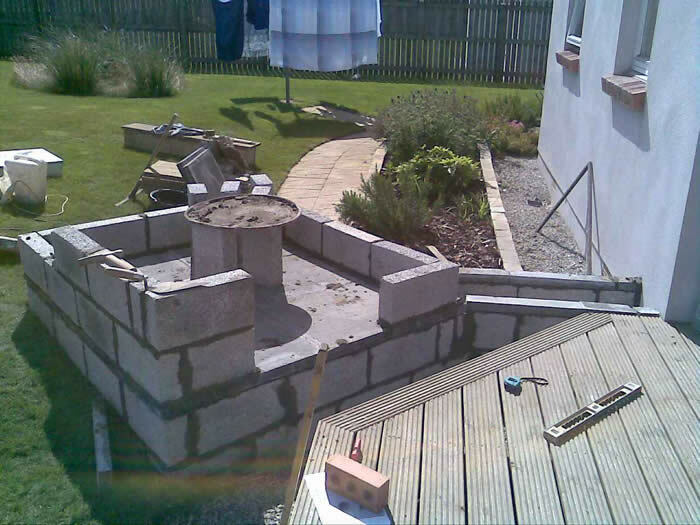 Build three courses of blocks (approximately 675 mm high) leaving an opening in the front wall for the wood storage area. Above this opening build in a concrete lintel or form a brick arch. In the top (third) course of blocks cut notches to take two or three 25 x 50 mm steel box section or angle supports. Build these steel supports flush with the top of the block work. Place one more course of blocks on top of the three lower courses and the galvanised steel sheet (approximately 900 mm height) and fill with insulating vermiculite concrete, finishing the vermiculite concrete approximately 25 mm below the top of the fourth course of block work. 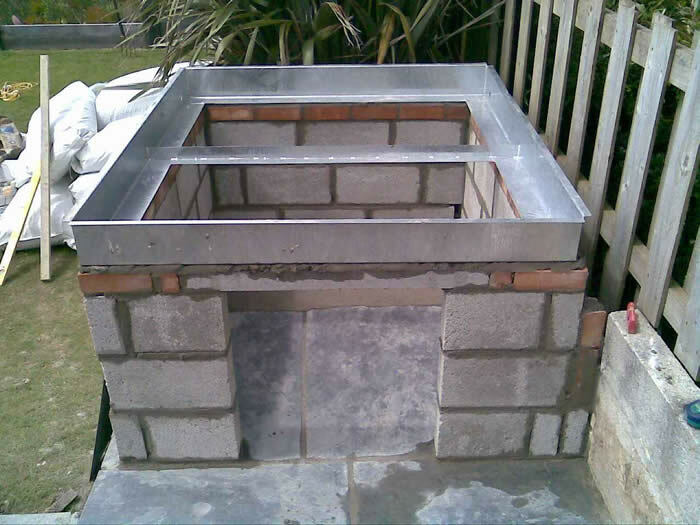 The steel supports and galvanised sheet support the wet vermiculite concrete until it is set and also support the weight of the oven. If there is the possibility of moving the oven in the future it is recommended to use one of our purpose made galvanised steel oven trays. Once the vermiculite concrete has set bed the oven’s baking floor on approximately 25 mm of a cement / lime mortar.